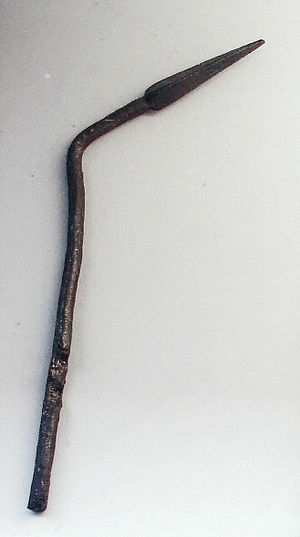 Nearly all Roman soldiers carried throwing spears known as Pilum, or Javelin. 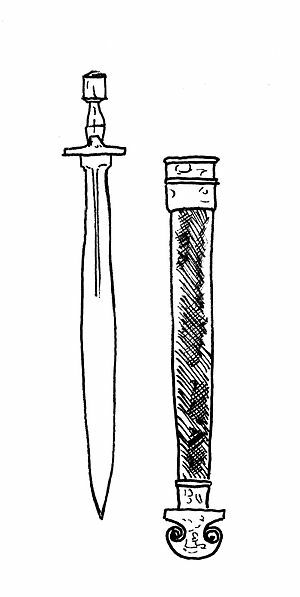 These were used mainly by skirmishers who would have three or four Pila (plural for pilum). These skirmishers (or Velites) would go forward in front of the main heavy infantry in very loose formation and throw their pila at the enemy lines. They had no amour, so the enemy infantry were unable to catch up with them and stop them. However, what the Velites were really good against were elephants. Arrows normally could not pierce the tough hide of war elephants, but javelins could. Also, the Velites were normally spread out, so less got killed in an elephant charge. The Pila themselves were made of a long wooden handle or shaft, which was attached to a long thin iron shaft which ended in a triangular head. The iron was made very soft, however (it seems like the Romans figured out annealing), and the reason is because when a Velite threw his Pilum, it would (if he is lucky) either stab his target to death, or it would puncture the enemy’s shield. Because the iron was so soft, it would bend upon impacting the shield, but puncture as well. This meant that that soldier now had a javelin stuck in his shield. If he tried pulling it out, he would have to stop and work on it for a bit. This he could not do while in formation, so he would just have to leave it in his shield or drop the shield, as the Pilum was heavy (some sources say they had lead balls attached to increase throwing power) and cumbersome, and really decreased movement. This entry was posted in Uncategorized on November 26, 2012 by Captain Belaq. Whenever one sees a photo like the one above, one immediately thinks ancient Roman soldier, and that is correct. 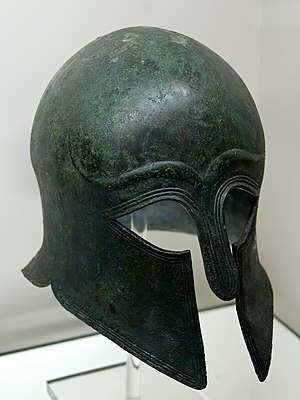 But the thing that makes one think that is not an awesome helmet like the Greek Hoplite, but the distinctive armor. 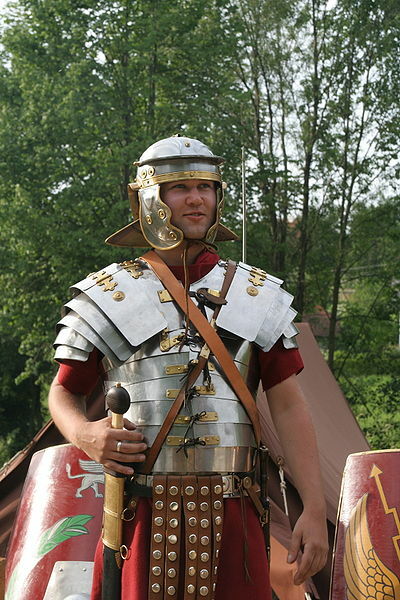 This armor does not have an official name (Wikipedia calls it “Lorica Segmentata“), but it seems unique only to the Roman legionaries. Remember, it was law that a Roman Citizen had to join the army for a certain number of years and then get rewarded with a farm and lots of money. During the time that they were in service, these citizens were the main fighting force of the Roman army, and so had access to the best armor. (Let’s call it legionary armor.) This armor was made up of several plates that were hinged together at the joints, (later on the hinges were replaced with simple rivets) and in some places tied together with leather cord. The Romans had access to iron, and they figured out a way to harden the plates of iron on one side only, as hardening both sides would make it too brittle. It’s actually pretty simple. What the Romans would do is they would have the already-formed plate and put a bunch of leaves (a source of Carbon) on top of the face that would be facing out from the body in the finished piece. When the metal was placed in the furnace, it would absorb the carbon and so become very hard. Which is nice to have when someone’s throwing a javelin at you. This entry was posted in Uncategorized on November 20, 2012 by Captain Belaq. 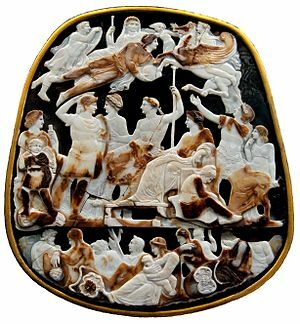 The Romans were very fond of jewelry, and though they got quite a lot of it from plundering other cities, they made some jewelry themselves, one of the most notable types is called a Cameo. 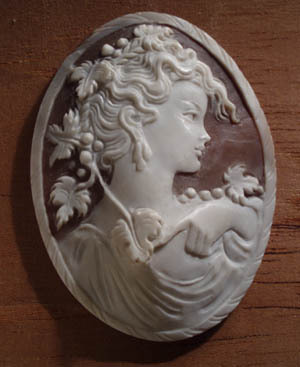 A cameo is when a layered stone (normally agate, sardonyx, or shell) is carved so the figures in the carving will have the color of the top layer whereas the background will be black or some other dark color. As before mentioned, cameos were very popular with the Romans, who imported large amounts of agate and shell to Rome to be carved. Most often these were of important people and senators in Rome, or gods and goddesses. Now let’s go into detail on how these cameos were made. 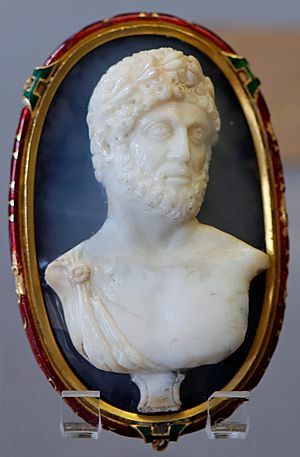 Rome, Italy 16 B.C: A piece of rough layered agate has just been delivered to the workshop of Quintus Pompilius, the royal jeweler for the Emperor Julius Ceasar. Quintus takes it in his hands and examines it. Two layers, red then white. Perfect. Quintus begins the cameo by scratching a line to mark out the outline of the lady (for Ceaser’s wife). Once this is done, he carves out all the white layer on the outside of the marked outline, so now the outline is marked in red, which will be the background in the finished piece. Now the carver begins the details, paying careful attention to the leaves which sometimes reaches out away from the hair into the “red zone”. The hair does not need to be so carefully watched, as the curves and creases flow freely across the maiden’s head. After much more carving, Pompilius polishes it and sends it off to the goldsmith with instructions to deliver it to the emperor as soon as it is finished. The next day it is seen around the emperor’s throat as he walks into the senate house, admired by his subjects (sort of) and hated by the senate. This entry was posted in Uncategorized on November 19, 2012 by Captain Belaq. This post is probably going to be the last about the hoplite’s equipment (no cheering, mind you). And so, I have to save the best for the last. The shield. You all have seen photos of the aspis shield before (yes, it wasn’t called ‘the shield’ it had a name, aspis, which happens to be a type of viper as well. Very annoying when trying to find photos), and so I’ll talk about first why the shield was so ‘honor’ based before I move on. One, if you surrendered to the enemy, they would make you give up your shield as a sign of surrender, and if you somehow managed to get back to your home country, your friends and family would see you don’t have the shield you left with, showing you surrendered, which was and always is abhorrent to the military commanders, (until they surrender themselves) as usurpers do not like to lose soldiers. Another reason is that if one broke ranks and fled, then to avoid getting run down by enemy cavalry or skirmishers, you had to drop the heavy shield which would slow you down considerably. But then, you get home without your shield. DISGRACE. To come with your shield showed that you were victorious, thus the legend where a Spartan woman, arming her son for battle, gives him his shield and says to come back with it or on it (when a soldier dies, his fellow soldiers use his shield to carry him home). Not an ideal mother, but it shows that surrender and losing your shield was abhorrent and disgraceful. The shield itself (the detail of the grips shown in the above photo) was wood, and almost three feet across; the size was vital for the Phalanx to succeed, as it was not desirable to get cut down by arrows. So the main part was wood, then covered with several layers of ox hide, then a layer of bronze on the the outside. The shield was curved to help defect blows, but what is interesting is that is the center, it is nearly flat! This is most likely because the phalanx formation had it so that there were several rows deep, the first row having their shields up and the spears out. As the phalanx advanced, the back rows would gently push ahead the rows in front of them, so keeping everybody in formation, but also creating quite a bit of force, and then the phalanx is ordered on the battlefield against another phalanx unit. Our phalanx advances, and when the two units meet, a few people on either side killed by the spears, but then they get too close for spears to be much use, and suddenly shields crash together, and what is supposed to be a battle turns into a major shoving match, with huge force because all the rows are pushing at the row in front of them. Here it is seen how the shields come into great use through their design. The because the shields ae rounded, the inside of the shield is concave. This enables the hoplites to push against their shields with their thighs and shoulders, the “concavity” keeping the hoplite’s lungs from getting crushed with the incredible pushing force. This goes on until either a few people on the same side freak out and breaks ranks and runs. Just losing a few people to deserting leaves the phalanx in chaos, and the enemy is able to shove through with little opposition, trampling the offense, or until one side is able to push harder than the other, in which case the weaker unit gets trampled. The shield was vital against any other troop type as well, could be used with it’s weight to pummel enemies, or just as regular protection from arrows and javelins. In the Greco-Persian wars, when the Persians first met the Greeks in battle, they were very surprised when their javelins could not pierce the Greek Aspis, showing how durable and well made the shields were. This entry was posted in Uncategorized and tagged aspis on November 13, 2012 by Captain Belaq. The Helmet of the hoplites was very important and symbolic, even today (Show anyone a picture like the one to the left, and they will either think greek warrior or Spartan). Often you will see in old vase paintings some Hero with his helmet tipped up on his head for comfort. 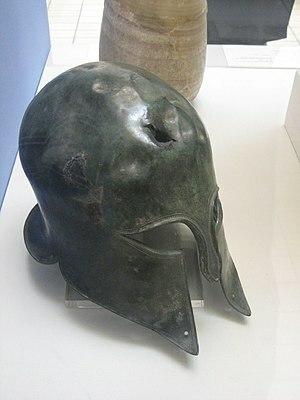 This shows remarkable design, though the helmet was most likely not designed with that purpose in mind, it is probable, like many products today, that the smith, after seeing the practice of tipping the helmet up on one’s head, would change the helmet slightly to allow for easier “tipping”. If you notice, there is hardly a single flat place on the helmet, and most helmets were probably polished or at least made extremely smooth. This made it practically impossible to pierce a spear through it. The only weak point was the face, as the eyes were needed for seeing, (obviously) and the eyeholes big enough to see anyone who’s about to attack you, and the mouth had to be left open so you can yell commands or shout for help. The ears were kept covered because in a battle, everyone is shouting (though some helmets had slits going from the bottom of the helmet up towards the ear). The nose also had protection. It is not really clear how it was made, but one source said that the bronze was cast into sheets, and hammered over a wooden form, every once in a while hammering the bronze together where the sheets met. Another plausible technique would be casting, and though this does not sound very plausible, remember that both the Hoplite’s spearheads and their swords were cast, and all of their bronze statues as well. After the helmet was done, if it was meant for a commander, the helmet could be engraved and sometimes a horstail plume would be attached on top for decoration, dyed in bright colors and very majestic looking. 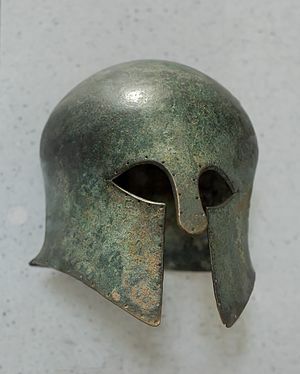 Overall, the Hoplite’s helmet is the most impressive part of his equipment. This entry was posted in Uncategorized on November 12, 2012 by Captain Belaq. The Phalanx formation, as I have said in previous posts, was very effective and almost impossible to get into from the front (where all those spears are pointed), but if the Hoplites are flanked (meaning the enemy is able to get behind them), the Phalanx formation is useless, and the hoplites would be unable to turn around and point the super long, cumbersome spears at the enemy in time, so the only thing to do is throw the spear at whoever you have time to throw at, and pull out your Xiphos. The Xiphos was a short sword designed for close combat. I mean, reeeally close combat and a reeaally short sword; some swords were only 30 centimeters long, though the average was one and a half feet long. The sword was made so that just after the hand guard, it was fairly thin, then gradually widened out and suddenly curved in to the point, though not so quickly that it would be inefficient to stab with. This design put most of the weight towards the front of the blade, enabling for a powerful swing in a small area of swinging, which is perfect for the close hand-to-hand fighting that would incur if the Phalanx was flanked. What is really surprising about the Xiphos is that Bronze was so hard, it would take a long time to forge it into a sword, so it was cast. Casting metal considerably hardens it when it is cool, and so the cast sword would be very brittle. The sword would be very thick though, and so this would cancel out the “britality” of the sword, yet it would still be hard, decreasing the chance of the edge being dented. When iron became available in commercial quantities, then the swords were forged, as it would take a lot of work to melt iron and pour it, and iron is a lot softer than bronze, making it easier to forge. This entry was posted in Uncategorized on November 8, 2012 by Captain Belaq. The Greeks were all about fitness, and if they were in battle, they couldn’t show off their abs while wearing metal cuirass’. And yes, despite what they show in the movie ‘300’, all the hoplites and Greek warriors that could afford armour, wore it. Anyway, where was I.. Oh, yes, abs. So the Greeks still wanted to show off to the enemy without getting killed, so they got an idea, why not decorate the cuirass with the abs? So that’s what they did, though armour decorated like this is very expensive, so it was usually only the commanders who were able to have one. One use that it is possibe the “abs” on the armour had, (other than showing off, of course) is that the ridges could deflect spear thrusts, because if the spear is going head on against the flat face of the armour, there is a good chance it is going to pierce, whereas hitting at an angle, or the slope of a ridge, there is nothing to catch onto, and so the spear is deflected. The breastplates were made by forging red-hot bronze until the desired shape, thickness and size is reached. Because it was just so expensive to buy copper and tin, and then alloy them, and THEN go through the laborious work to forge it into armoure that would resist breaking or being pierced in battle, the eventual buyer will have to pay quite a lot for it. But then, when trade began to progress, Greece was right in the middle of the shipping routes, and so they got much of the world’s commerce, meaning more money, meaning more bronze, meaning more armour. This meant that more people were willing to join the army, because the better equipment they had, the less chance of getting killed and the higher chance of being put in one of the better units, meaning more pay. So with trade, the military power of Greece increased. This entry was posted in Uncategorized on November 7, 2012 by Captain Belaq.